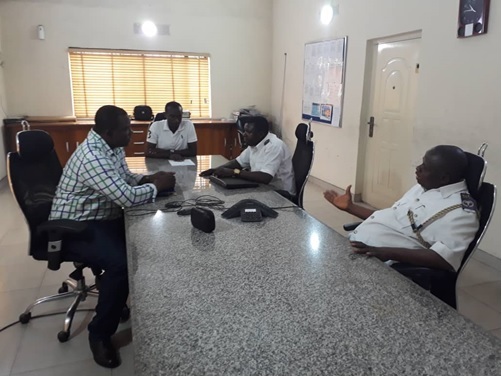 Inspectors from the Rivers State Ministry of Environment, Environmental Health Section, led by Vite Adumene, visited our Port Harcourt office in January 2019. The visit was to ascertain the level of our conformity to environmental health and safety regulations, and more importantly, verify how well the health of workers is promoted. The team of inspectors focused on pest control, industrial hygiene and water sanitation. They went through documentations using their checklist which covered several areas among which are: staff health facilities and surveillance, implementation of health and safety management system, source of water supply and treatment, pest and rodent control, compliance with waste. management laws, proof of registration of agent and fumigation certificates for relevant quarters, building sanitation and potable water analysis. They were impressed with what they met on ground and commended BOG for always keeping to standards set by the Ministry. Our premises was certified fit at the end the exercise and opportunities for continual improvement were identified. Representatives of Rivers State Ministry of Environment with members of BOG’s QHSE Team during a recent inspection in the Port Harcourt Office.